The Act of February 21, 1857 mandated that a smaller cent be coined. The Large Cent, a US coinage staple since 1793, had become too costly to mint. The Flying Eagle Cent was the first small cent, which was actually minted starting in 1856, to have specimens ready for display to members of Congress. Thus, it is technically a pattern coin, since the law establishing the new small cent was enacted in 1857. It had the exact same diameter as our pennies today. Another important distinction of the Flying Eagle Cent is that is was composed of a copper-nickel alloy. All large cent predecessors were composed of nearly all copper. The new alloy produced a lighter colored coin that proved to be more difficult to manufacture, due to the hardness of the metal. As many as 850 of the 1856 Flying Eagle Cents were minted as business strikes (many of these were circulated in the halls of Congress -- which led to the passage of the 1857 law). There were also approximately 1000-1500 proof strikes for collector sales. Because business strikes were produced in lower quantities, they are generally more valuable in comparable grades. That is, an MS-65 business strike 1856 Flying Eagle sells for a lot more than a PF-65 example. The blue line above charts the percent change since the year 2000 in retail coin price of the 1856 Flaying Eagle Cent in G-4 condtion, beginning at a baseline index of 100. The red line depicts the percent change of the Rare Coin Values Index, which is an overall measure of the US rare coin market. 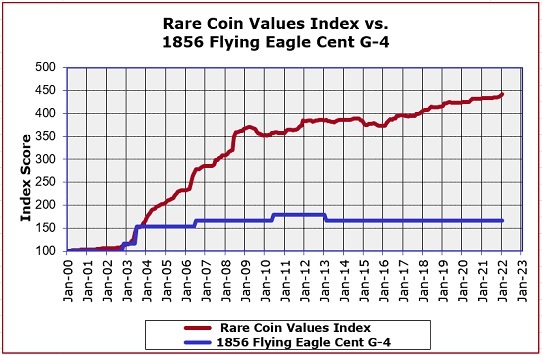 As you can see, the 1856 Flying Eagle Cent rates far below the Index composite score, but is still considered by numismatists to be a key date cent. The 1856 Flying Eagle Cent is one of 87 coins tracked in the Index, and is updated monthly.